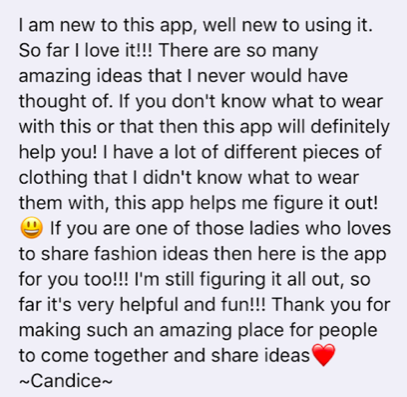 So many women looking for the best outfits app… here’s a review! 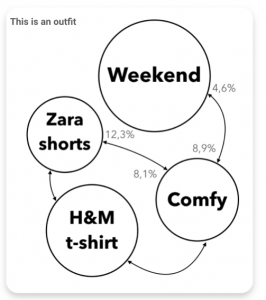 This is today’s review of the outfits app Chicisimo that we love, and wanted to share with you. It’s available in the App Store – Thanks Candice! Need help deciding how to combine your clothes? Did you come here looking for a Polyvore alternative? Let us know how Chicisimo is useful as your outfit maker app. CategoriesChicisimo reviews Tagsamazing ideas, app of the day 2019, combine your clothes app, how do i choose an outfit?, Is Polyvore coming back?, Outfit maker app, outfit planner, outfits app, useful apps, virtual closet, wardrobe organizer, What are the best fashion apps? Previous PostPrevious Chicisimo is looking for a remote Growth Designer. Full time.